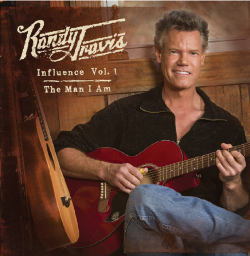 Lovin' Lyrics Music Promotions: CD REVIEW: RANDY TRAVIS: "INFLUENCE VOL I - THE MAN I AM"
CD REVIEW: RANDY TRAVIS: "INFLUENCE VOL I - THE MAN I AM"
CD: "Influence Vol 1: The Man I Am"
When it comes to the kind of music that reminds you just how great it feels to be a true country music fan, you don't need to look any further than Randy Travis. Randy Travis is the epitome of what it means to be country, from his twang all the way to his traditional country heart. He takes from that tradition and pulls a selection of songs that mean the most to him, that represent who he is and he is the picture of country. "Influence Vol I: The Man I Am" reaches deep inside and, through his deep baritone voice, wailing steel and sometimes swinging, sometimes humble guitar, shines the light on the stuff country music is made of. You'll find no over-production, no straining vocals or overbearing electric guitar here but what you will find are the basics at their best, melodies and vocals that are understated yet impactful, and instrumentation that is simple yet complex. The cd is barely 3 days released and already garnering positive reviews across the board. In a few years of set backs for Randy, I think he's finally gained positive traction with the release "Influence". It's time that the music took center stage again for Randy because like he said himself, "you've been too gone, for too long". There truly isn't a track on this cd that isn't purely and wonderfully Randy. The songs themselves may not be Randy's originals, but they definitely Randy. One of the largest influences on the cd is the Okie from Muskogee, Merle Haggard, with the first four cuts being covers of his music. The slow, drawn melody and crying instrumentation of Merle's 1974 hit, "Someday We'll Look Back", immediately brings back memories of first hearing Randy on the radio in the late 80's with his first hit, "On the Other Hand". Man, what good music we had back then! The swingin' piano and fiddle in "Big Butter and Egg Man" get your toes tapping and your head doing the infamous country head bob. One of our favorites on the cd also happens to be one of Merle's best "non-hits", the reflective ballad "What Have You Got Planned Tonight, Diana?". Other artists that heavily influenced Travis that are represented on this project are Ernest Tubb, Lefty Frizell and Waylon Jennings. If we reviewed all of the songs on this cd, we'd go on and on and basically say the same thing, they're all pretty darned awesome and they're all the kind of music that put Randy Travis on the country music map. So we'll leave it at that, go buy yourself a copy of the cd and review them personally. You won't be disappointed. Randy's back, both in health and in song, and for that, we're thankful! We're also grateful for the artists that inspired this cd. You can pick up "Influence Vol 1: The Man I Am" at most music retailers and online at iTunes and Amazon.